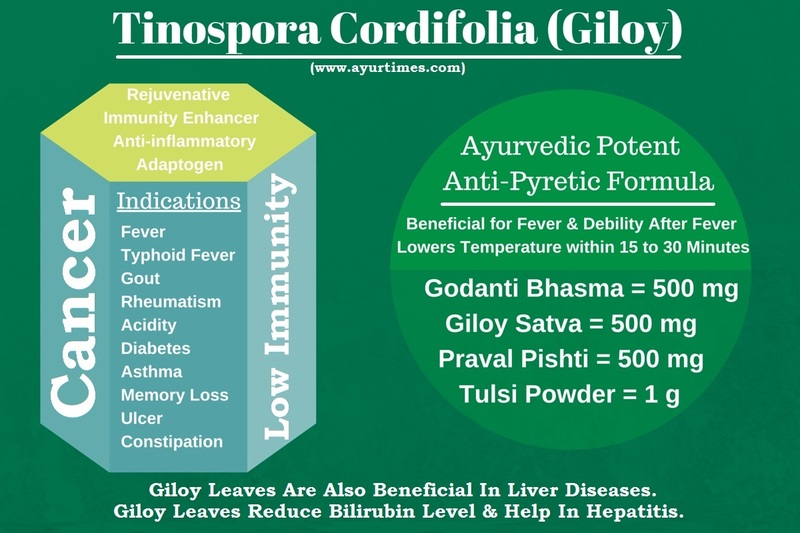 Tinospora Cordifolia (Giloy in Hindi and Guduchi in Sanskrit) is an important immunomodulator herb. Ayurvedic practice without this herb may not be possible. It is also an important ingredient of several ayurvedic medicines. Giloy is beneficial in fever, chronic fever, infections, low immunity, cancer, asthma, gout, rheumatoid arthritis, recurrent infections, recurrent common cold, chronic catarrh, chronic fever, chronic fatigue, etc. In this article, we will discuss all about them. Stem is a main medicinal part of Giloy (Tinospora Cordifolia). Leaves are also beneficial in liver diseases. Giloy (Tinospora Cordifolia) has following healing properties. Giloy has studied for its immuno-modulatory, anti-inflammatory, anticholinesterase and analgesic effects. It also has gastrointestinal protective effects. Giloy (Tinospora Cordifolia) is helpful in following health conditions. The main effect of Guduchi or Tinospora Cordifolia is on AMA (Toxins formed in the body due to malabsorption and ill digestion). It reduces AMA and helps in all types of diseases in which AMA is associated. It is suitable for every person with every type of body type or with any disease due to its immunomodulator, rejuvenative and adaptogenic action. According to ayurveda, it increases the diminished DOSHA or DHATU and reduces the increased DOSHA or DHATU, so it brings balance of three DOSHA in the body and helps preventing all types of diseases. Giloy (Tinospora Cordifolia) is beneficial in all types of fever and infections including viral and bacterial infections. However, it is not a potent antipyretic, but it is good for its immuno-modulatory action. It reduces span of fever and duration of infection. When it is combined with Praval pishti, its antipyretic action is improved and it works well. It also maintains physical and mental strength of the patient and prevents fever-associated debility. It is beneficial in following symptoms associated with fever or infections. Giloy Sat is more beneficial in fever as compared to Giloy powder. In modern formulation, Giloy extract is also used. According to ayurveda, there are two main factors involved in fever. Giloy arrests AMA formation and reduces the formed AMA by improving digestion and absorption. It also boosts natural immunity of the body, which helps fighting with the microbes. This formula has potent antipyretic action. Its effects start within 15 to 30 minutes. Its effects on lowering temperature are well comparable with acetaminophen. Other herbs and ayurvedic remedies are also required according to the type of infection involved. Giloy is also beneficial for debility that occurs after typhoid fever. The following formulation helps in reducing chronic debility. The results with this formulation start appearing within 7 days. If the patient has 99º F temperatures or has complaint of fatigue, tiredness, restlessness, weakness, pain in legs and body aches, then he may also require Yashad Bhasma (Zinc Supplement) or Vasant Malti Ras Gold to combating with all these symptoms. Note: Giloy is more beneficial in chronic fever or diseases as compared to acute fever or during startup of the disease. It is more effective in low-grade fever than high-grade fever. Guduchi acts on following symptoms in skin diseases. Tinospora is a good remedy for following skin diseases if above symptoms are more prominent. In some skin diseases, Giloy may not work alone. The local application of Neem oil or oil processed with following herbs is beneficial. Pilonidal Sinus (PNS) is also called sacrococcygeal fistula and Pilonidal abscess or cyst. It occurs on or near natal cleft of the buttocks. In this condition, oil processed with Giloy Juice and Turmeric Paste is beneficial for removing skin debris, pus and dirt particles. It boosts the healing process of wound and treats Pilonidal sinus. Heat and simmer the mixture of these three ingredients until the only oil remains and all water content get evaporated. Strain the oil and discard all herbal residues. Keep this oil in glass container and use when required. Giloy is a drug of choice for uric acid and gout in ayurveda. Guduchi reduces uric acid formation acting on AMA toxins and improving metabolic activities in the body. It also increases the elimination of uric acid through kidneys by improving renal functions. In ayurveda, associated AMA plays an important role in development of gout, which is preventable and treatable with following herbal combination. Giloy Powder and dried ginger power is the most effective natural remedy described in ancient texts of ayurveda. It is also proved effective in this modern era. Punarnava can also be added in this formulation to potentiate its effect. In absence of punarnava powder, one can also use Punarnavarishta. In some people, this combination can cause acidity due to excess amount of ginger. If patient has history of acidity or heartburn, the dosage of ginger should be reduced. In Interstitial Cystitis, Giloy Juice, Giloy Churna, Giloy Sat, or Giloy Decoction, all formulations of Giloy are beneficial. Giloy reduces damage and protect the epithelium of the bladder. Generally, it is not used alone. It is used along with Chandraprabha Vati, Gokshuradi Guggulu, Punarnava and Mustak (Cyperus Rotundus). The perfect medicine for Interstitial Cystitis is Chandraprabha Vati. Take powders of these herbs in described ratio and 240 ml water. Boil the herbs in water and simmer the mixture until water remains one fourth (i.e. 60 ml). The Giloy decoction is ready for use in Interstitial Cystitis. Take Chandraprabha Vati and Gokshuradi Guggul with this decoction for a week. It helps clearing the bladder and removing the toxins. After a week, one should take 500 mg Giloy Satva and Chandraprabha vati (1 gram) twice daily until getting complete relief from Interstitial Cystitis and its symptoms. In chronic pancreatitis, Giloy reduces inflammation and upper abdominal pain. It is also AMAPACHAKA (Detoxifier) according to ayurveda. In Chronic pancreatitis, steatorrhea (oily and smelly stools) occurs, which indicates AMA in the body. Giloy reduces these toxins and clears oiliness and bad smell in the stools. It is also likely to inhibit the activation of pancreatic enzymes within the pancreas, which is the main cause of pancreatitis. Therefore, it prevents and reduces irritation due to enzyme within the pancreas and reduces the inflammation. Furthermore, it prevents repeated bouts of pancreatitis and prevents damage to the pancreas. There is not side effect reported using Giloy in recommended dosage. The excess dosage of Giloy Powder may cause feeling of excess heat sensation in the body. Excess dosage of Giloy Satva does not give this type of feeling. How long one can take Giloy for overall good health without any side effects? Giloy in natural form can be taken for long-term even for years. Giloy water extracts are also safe for long-term. What is the Dosage of Giloy for long term usage for maintaining good health? Giloy churna should be taken 2 grams once a day for good health and improving immunity. Giloy Sat can be taken in dosage of 500 mg per day and Giloy Ghan Vati can be taken 1 tablet per day for similar benefits. Dear Dr. Singh, could the pregnant women use guduchi?